I heard about the 5th Annual Great Food Blogger Cookie Swap back in October, on a blog somewhere – I can’t remember – where bloggers are given three names to send each a dozen cookies and also receive cookies in exchange, all through the mail. This caught my interest for obvious reasons and the idea of raising money for charity. Three dozen cookies homemade cookies shipped to my door? YES, I’M IN!! How fun would this be I thought. But then the allergen-free side sunk in and thought, it’s most likely for the all purpose flour and butter crowd, not for us gluten and dairy free folks. I looked into it anyway and learned that the cookie swap (hosted by Julie from The Little Kitchen blog and Lindsay from Love and Olive Oil blog) has thought of those with allergies too (those gals rock!). Can you believe it? 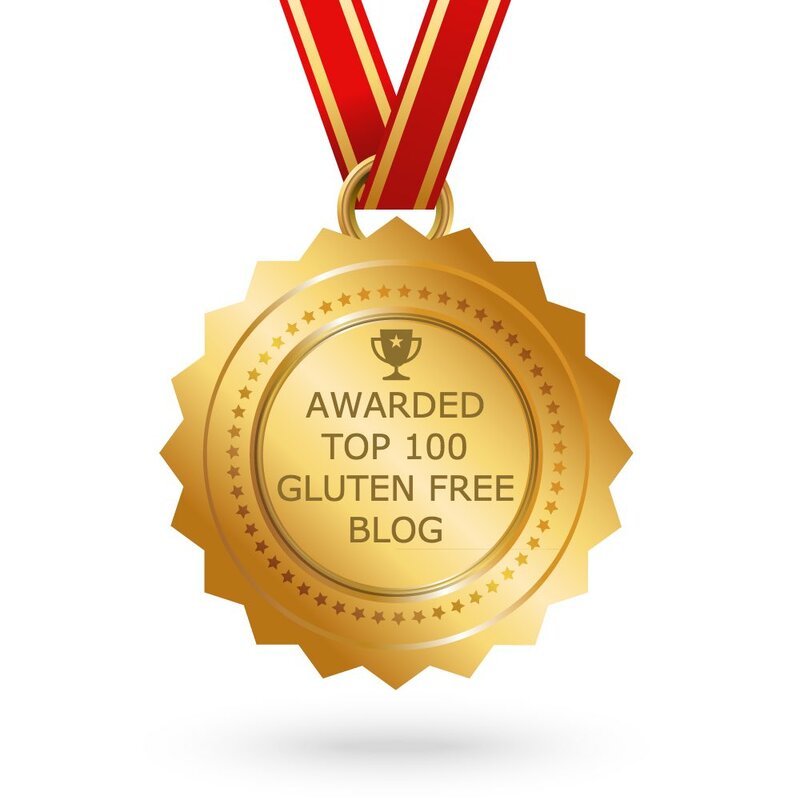 It felt so good to know that those who cannot eat gluten, dairy, or nuts, are paleo – whatever the case may be – can also participate. I’m ready for cookies. By the way, getting homemade cookies in the mail had me feeling like a little girl (sort of, not really) patiently waiting for my Cabbage Patch Kid to arrive (does anyone remember those? gosh I keep dating myself!) – SO much fun – and times three! As fun as that is, it was gratifying to know that this fun gig helped raise thousands of dollars for children with cancer this year! How awesome is that? Please check out their site Cookies for Kids’ Cancer (click here). It’s pretty cool what they are doing over there and to be able to participate was a lot of fun. Then the age old question: what cookie to make? I originally thought a meringue with filling, but shipping had me worried it would be a crumbled mess so I went with this almond joy cookie. Not really like an almond joy candy bar since the cookie is not a coconut dense filling fully enrobed in chocolate like the name would suggest (couldn’t come up with a better name – sigh) but more of an almond shortbread style cookie with a good amount of almond paste for a good dose of almond flavor, dipped in just enough chocolate with a sprinkling of coconut and almonds to remind us of this classic candy bar in these little cookie bites. 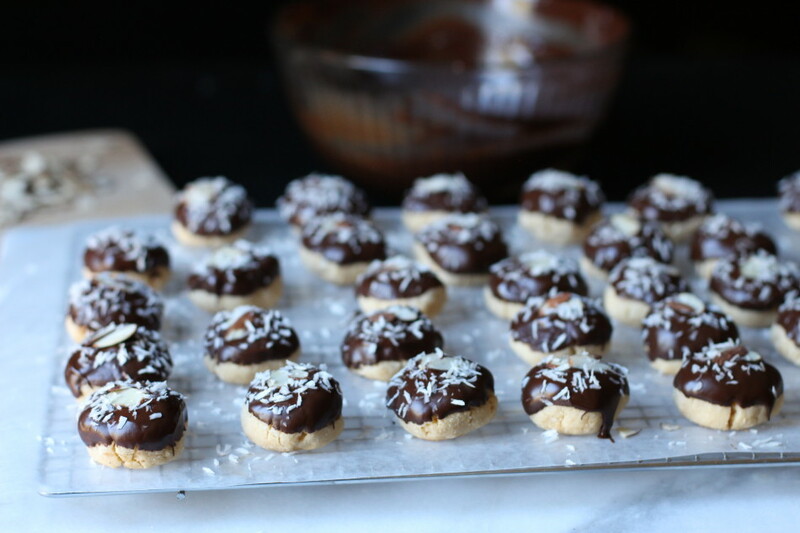 Two of the bloggers I sent to are also Paleo (in addition to gluten and dairy free) so I needed to come up with a cookie that is also grain free. OK. Cookies look and taste good and ready to handle the trek across the country … off into the fridge to chill before shipping them out later to the ladies. But then my plan derailed … I should know better than to make cookies while the kids are home. I’m counting the cookies (a dozen for each) to box and I’m short cookies. NOT ENOUGH COOKIES. Five cookies were missing despite telling my boys to stay away!!! Of course, one of my sons tells me he didn’t know. As if that wasn’t bad enough, I didn’t have enough coconut flour to halve the recipe and had guests coming for dinner in two hours with food in the oven (!). Luckily, I had tapioca starch on hand and with a little calculating I combined the remaining coconut flour with tapioca starch and made another (half) batch, to ship the next day (see my note in the recipe about this!). Surprisingly (and I say this sarcastically) the remaining cookies were gone by Sunday afternoon. 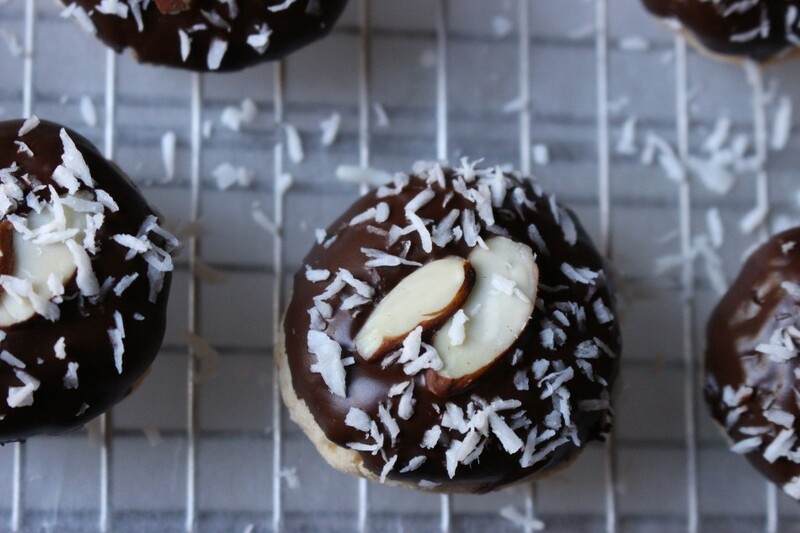 By the way, these would make a nice holiday food gift for the almond lover in your life and definitely one to bring to a cookie exchange. Now that I got mine shipped out here are the goodies I received … hello holiday spice!! 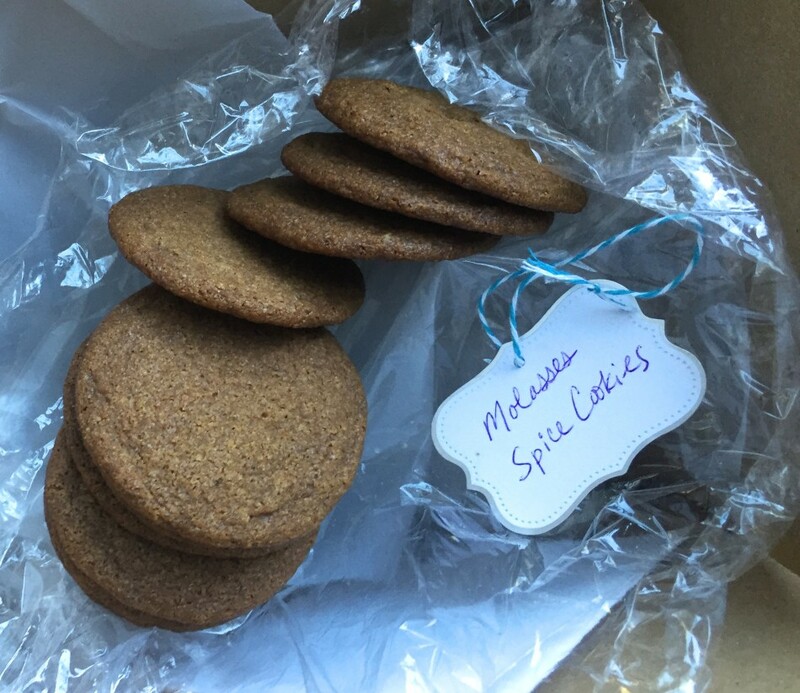 I got these molasses spice cookies from Jen over at Kingfield Kitchen blog first and on National Cookie Day! These were YUMMY – the spice came through as soon as I opened the bag and a nice coconut flavor from the coconut oil, which I love. Ummm, I think it took about six seconds to polish them off. 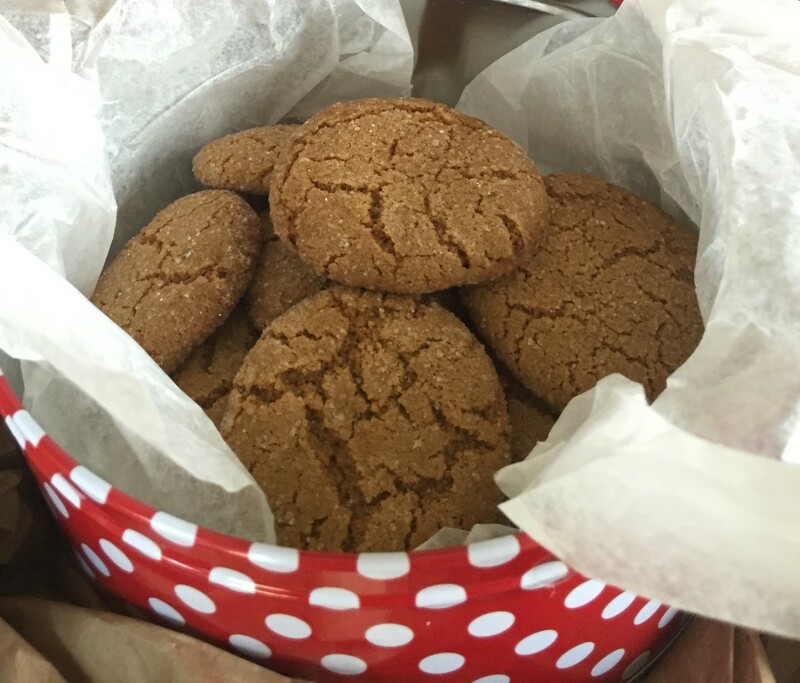 Then these ginger molasses crinkle cookies came the next day with a sweet note from Jackie over at La Casa de Sweets blog in a festive holiday tin. Full of spice and crinkle; even though we had cookies the day before I had plenty of room for these delicious cookies. Once my boys heard cookies arrived they were gone. Luckily, I had two of these heavenly cookies before they got to them. I need to be fast in a house full of boys. 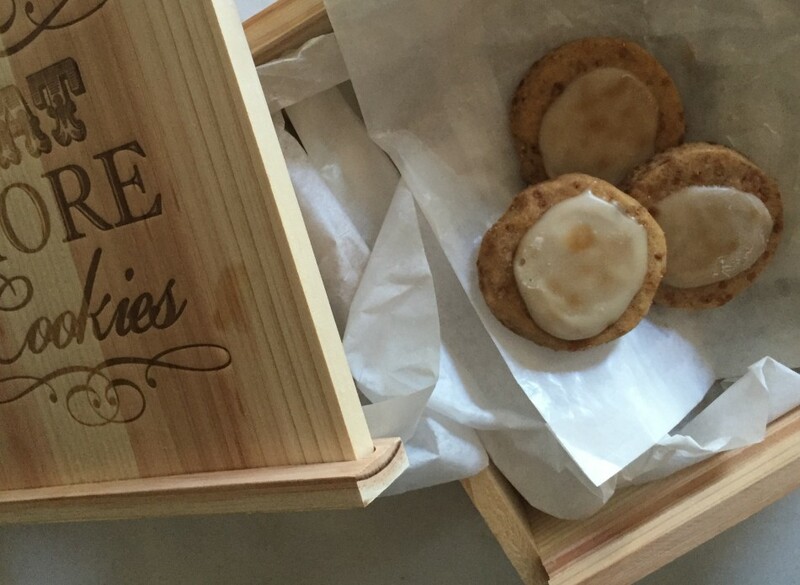 And then my third swap came a couple of days later from Johnna over at In Johnna’s Kitchen blog with chai spice cookies in a pretty wooden box. Glazed chai spiced cookies was a nice treat to nibble on with my lavender tea given the unusually windy day we were having. Perfect timing. I love chai spice cookies and don’t know why I haven’t made them yet. Johnna reminded me I need to because a dozen is never enough. 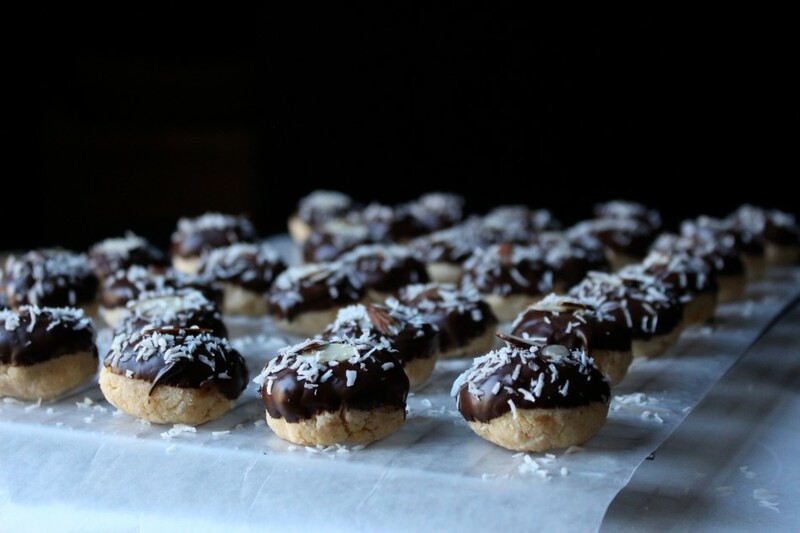 If you’re a blogger, you must check out the cookie swap for next year. Supporting a charity, baking and eating cookies is something I can get used to every year. If you’re looking for some holiday cookie inspiration, see all of the cookie recipes from last year’s cookie exchange see here and here. 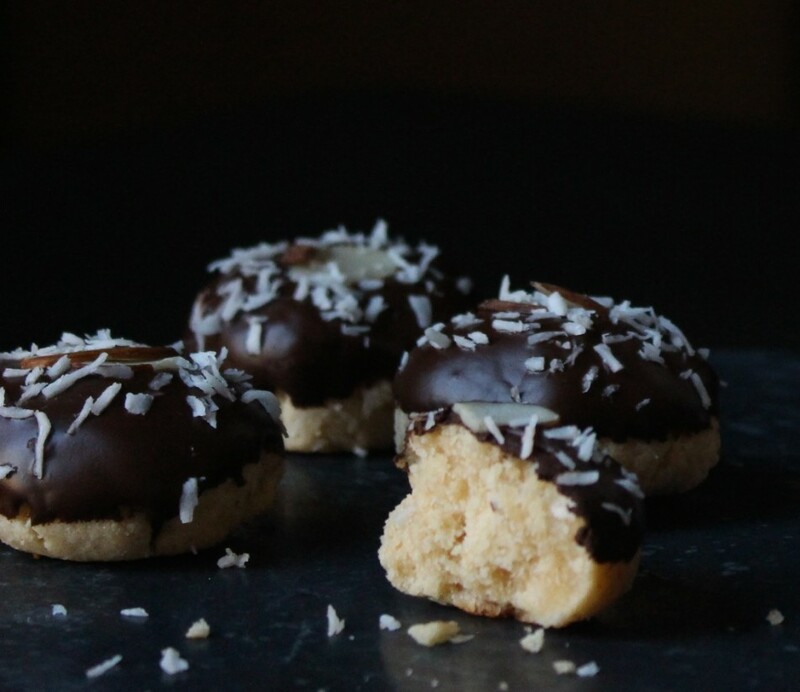 The flavors of an almond joy candy bar in cookie form without all the unhealthy additives or preservatives! Note: I didn’t have enough coconut oil on hand (sorry!) to keep it strictly Paleo so I used Earth Balance - a blend of palm fruit, canola, safflower, flax and olive oil. My boys snuck a few cookies (per usual) so I was short 5 cookies and because I ran out of coconut flour (!) I used tapioca starch…you will see a little “T” on the bottom of 4 cookies. If you prefer the tapioca/coconut blend (used 6 oz. coconut flour + 10 oz. tapioca starch blend) then add 2-3 minutes of baking time since they don’t absorb the fat and egg as much as all coconut. The coconut/tapioca flour blend has a bit more crumb that only using coconut flour. Preheat oven to 350 degrees F (177C). Line two baking sheets with parchment paper or silpat. In a stand mixer fitted with a paddle attachment, or handheld electric mixer, cream buttery spread, and sugar for 1-2 minutes until light and fluffy. Add kosher salt, almond extract, coconut extract, and almond paste, beat until almond paste is smooth. Add eggs, one at a time, after blending in each then add coconut. Add flour and mix until just blended. Fold in any remaining flour or “butter” from the bottom of the bowl. Using a small sized ice cream scooper (about a heaping tablespoon full), scoop out dough and roll into a ball between your palms. Note: I weighed each cookie (26 grams each) to ensure even baking since new to solely using coconut flour. Bake cookies for 9-11 minutes. They will look similar in color with the bottoms golden brown. Careful lifting the hot cookies, they are very soft. Let cool on the baking sheets for 30 minutes then transfer onto a wax paper lined cooling rack. Set aside. Note: If using silpat liners check the cookies at 9 minutes. Meanwhile, prepare chocolate glaze. Set a medium saucepan filled with 2-3 inches of water on medium heat to simmer, when simmering place a heat-proof glass bowl directly over (making sure the water does not touch the bottom of the bowl). When the bottom of the bowl appears steamy add chocolate chips. Let it melt a minute or two before blending. Continue to blend until most have melted. Remove from heat, the residual heat will melt remaining chips. When slightly cooled (bowl should be warm to the touch, not hot) dip each cookie halfway into the chocolate and place on wax paper. 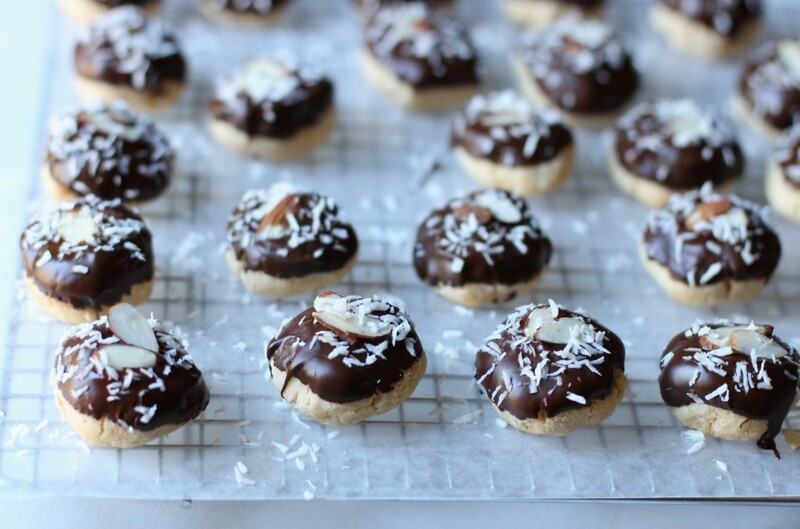 Add two almond slices and sprinkle shredded coconut on top. Chill for about an hour to set before eating. These are also freezer friendly up to two weeks (sealed in a freezer-safe container with cookies stacked between wax paper), and also will remain fresh covered at room temperature for up to 2 days or refrigerated up to 5 days. These cookies are adorable! ...your boys stealing cookies had me hysterical, my kids do the same thing when there are cookies around!! Thanks Amy! Who can resist a cookie?! These are grain free?! Woohoo! Do you suggest all coconut flour or with tapioca? Definitely making this week...thanks Jessica! Coconut flour combined with tapioca has a bit more crumb, that's really the only difference. 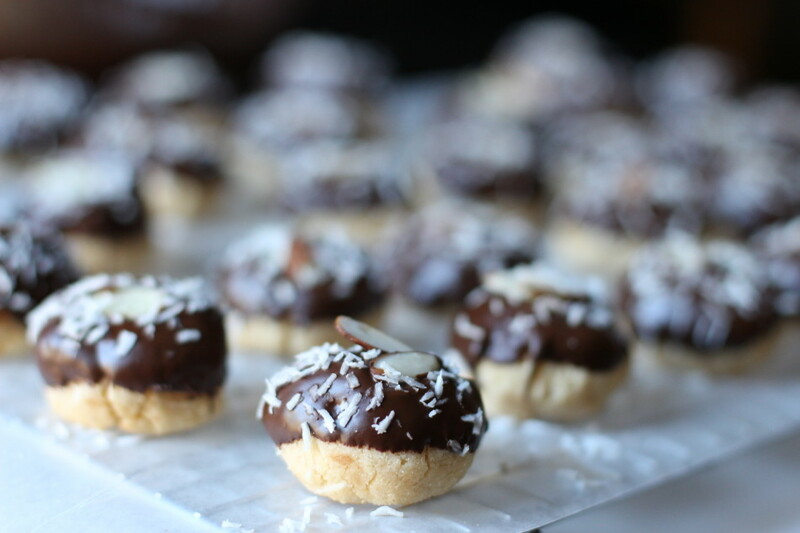 The coconut doesn't come across strong due to the almond paste and extract. Enjoy! Hey Jessica, This has a ton of eggs, why so many in a cookie recipe? They do look pretty but wondering what the reason is. Thanks. 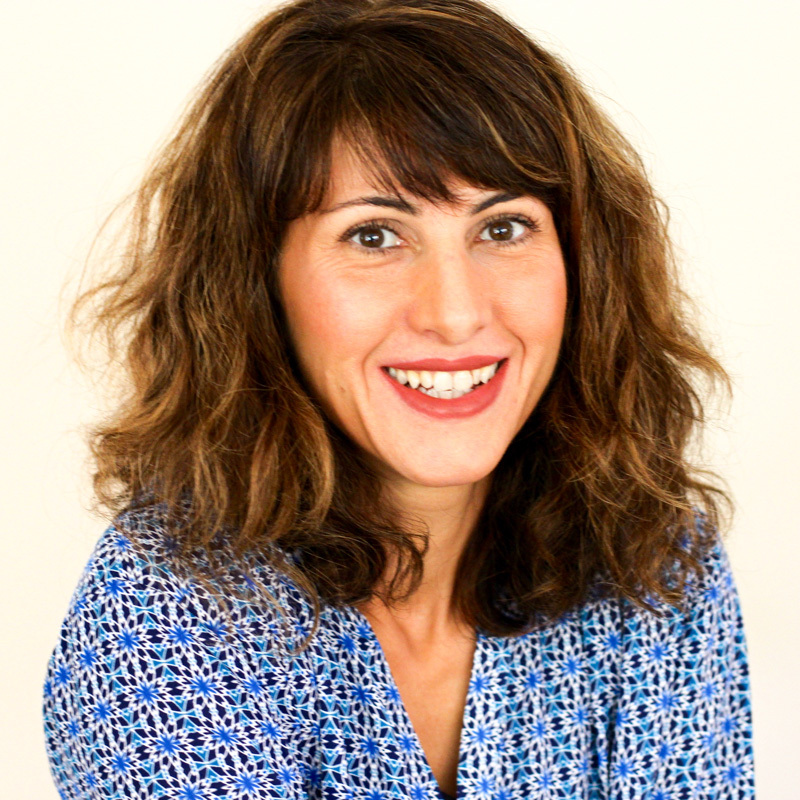 Hi Lori, both coconut flour and almond paste act like a sponge. When combining both (coconut flour to make this Paleo) it can be dry so in go the eggs, lots of them, to make these just right. Hope that helps! I never understood why it's called an Almond Joy bar since it hardly has any almond other than one LOL! Cookies look delicious and anything almond and chocolate is a big hit at my house. Can I swap out the coconut flour for gluten-free one to one baking flour by Bob's Red Mill? Thanks Jessica! Thanks Maureen! Haha so true, where is all the almond?! Swapping out the coconut flour for Bob's Red Mill will also require a little tweaking...minus two eggs and one tablespoon of sugar. Enjoy! These cookies look marveolus, I can't wait to share this with my friends. I totally get the busy thing!! Haha, YES to being cookie swappers - YUM! I'm so happy I was your Cookie Swapper! These were AMAZING!